At the heart of a sleepy French village, 45 minutes from the historic and happening seaport city of La Rochelle, Maison du Puits is a brilliant family villa with a separate cosy cottage that’s perfect for grandparents or teenagers waiting their own space. 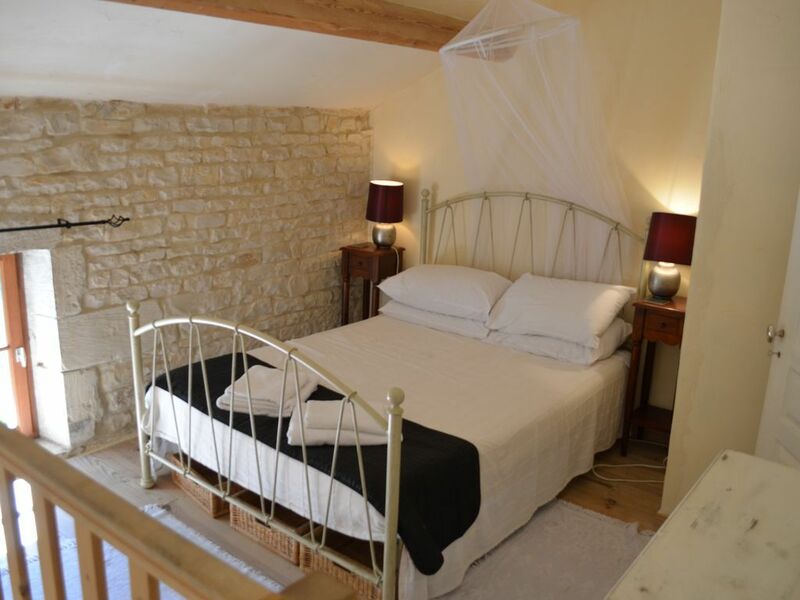 The villa and cottage are lovely boltholes in their own right, but even better when extended families really make the most of the shared pool, games barn and fab courtyard kitchen/lounge. 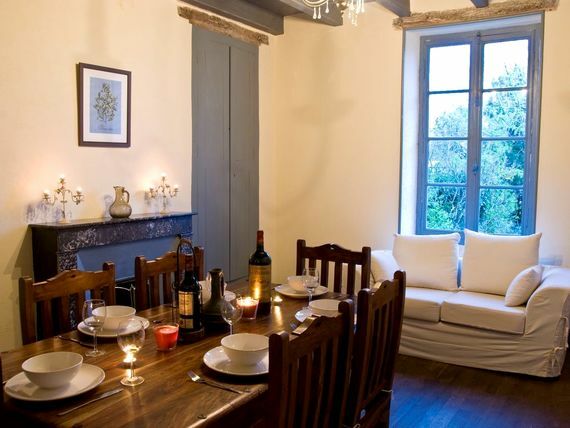 Maison du Puits is a period Charentaise house that’s as French as French can be, with the elegant interior stripped back to an almost minimalist take on boutique rustic chic. 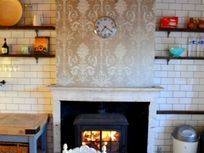 Families can snuggle down by a wood burner in the living room to watch the Sky TV channels, or choose from the library of books and DVDs filling the shelves, but children might well disappear into a screened off play den in the dining room, with its own DVD TV, dolls house, art easel, rocking horse and loads of toys. 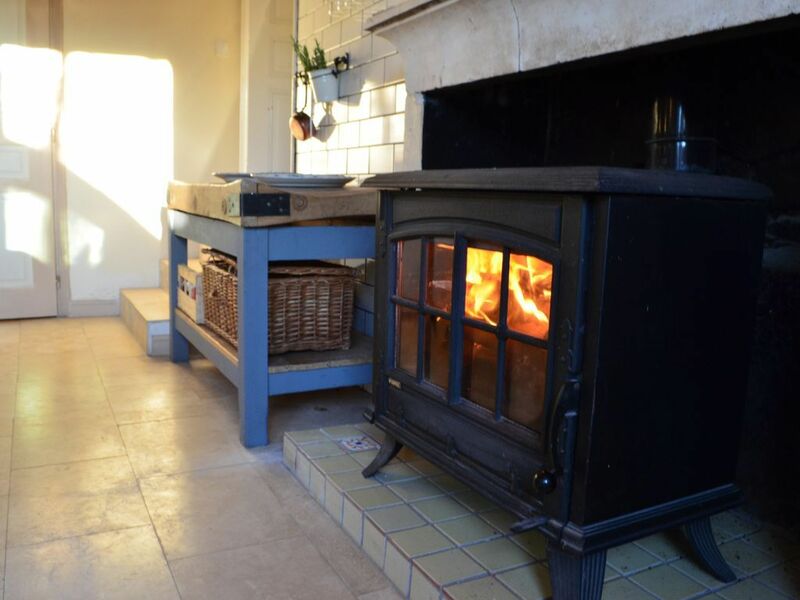 The cream kitchen is a timeless classic, with fridge freezer, modern appliances and a breakfast table by a wood burner, but both the house and cottage really come into their own with mealtimes made easy outdoors, which can even become a highlight of the holiday. A high walled courtyard has been furnished as an outdoor lounge and dining area to kick back with a good Bordeaux while a fully equipped summer kitchen makes self-catering a piece of cake, whether simmering simple pasta on the hob, sizzling something tasty on the BBQ or personalising pizzas for the wood fired oven. One of the barns off the courtyard makes a cool teenage hang out, with table football and a pool table while the gardens are safely enclosed for younger children to explore. In the Charentaise sunshine, young and old will head for the solar heated pool in a sun trap walled garden, where kids can have fun with inflatables while grown-ups laze on the poolside loungers. Maison du Puits and Le Petit Logis are two holiday houses on the same plot, which share an enclosed garden, walled swimming pool and a summer kitchen courtyard with an outdoor lounge. The 3-bedroom house and 1-bedroom cottage can be booked separately or together for up to 12 family and friends, plus 2 babies in cots. 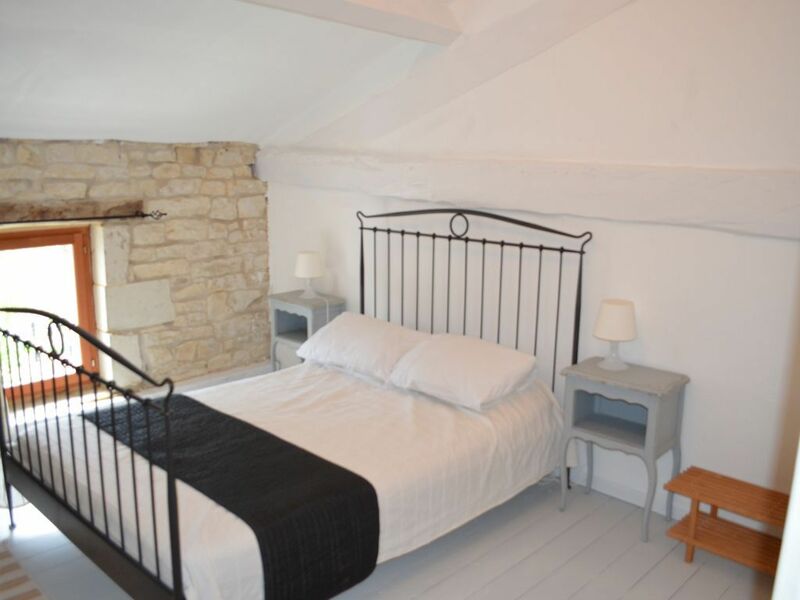 Maison du Puits (sleeps 8+baby) is a period Charentaise house which has been with sensitively renovated to preserve its character whilst bringing it update with simply stylish interior design and providing all the creature comforts of a modern family home. 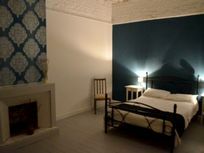 The house has three spacious bedrooms, with stripped wood floors, wrought iron bedsteads and space for a cot, (two travel cots available). 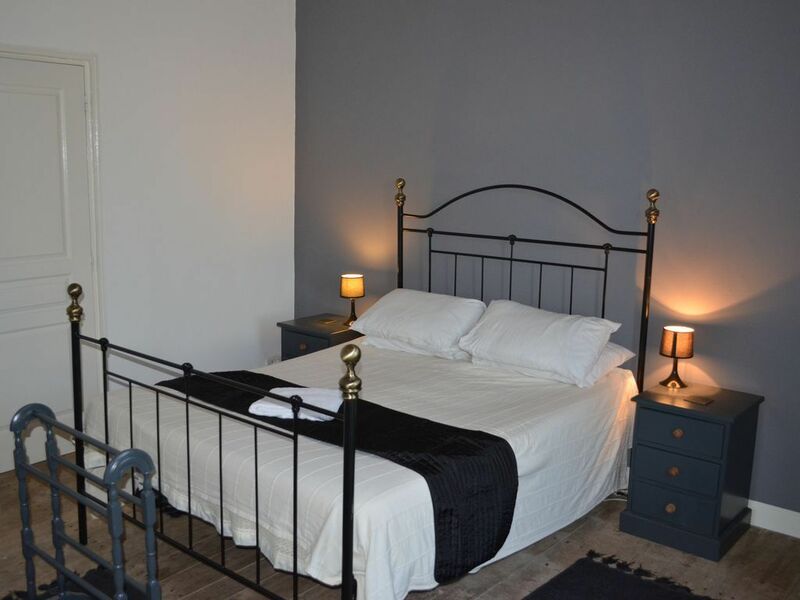 The master bedroom has a king size bed and an ensuite shower room with a WC; a family quadruple bedroom has a double bed and a comfortable double sofa bed; and the third has a double bed. A large luxury family bathroom has a Parisien washbasin, roll top bath, walk-in shower ‘pod’ and WC. To the front of the house is a spacious, well-appointed lounge with comfortable sofas, a wood-burning stove in a feature fireplace, a plasma TV with English channels, a DVD player and shelves full of books and DVD’s. Next to the lounge families can dine in style in a formal dining room, with a marble fireplace and teak furniture, but at other times a screen can be pulled back to make the room a children’s play den with lots of toys, a dolls house, rocking horse, art easel and TV for playing DVD’s. Both reception rooms have large shuttered windows looking out over the mature garden. 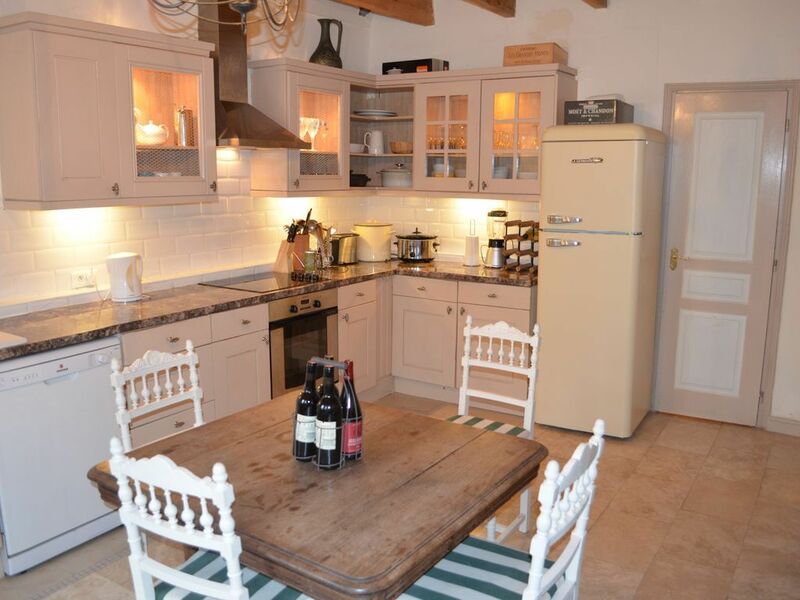 The high spec fitted kitchen has a French farmhouse feel about it, with a dining table by a wood burning stove, a Smeg fridge freezer, the latest appliances and handy extras such as a blender, bottle sterilizer and slow cooker. An extra fridge freezer and a washing machine is in an adjoining utility room. 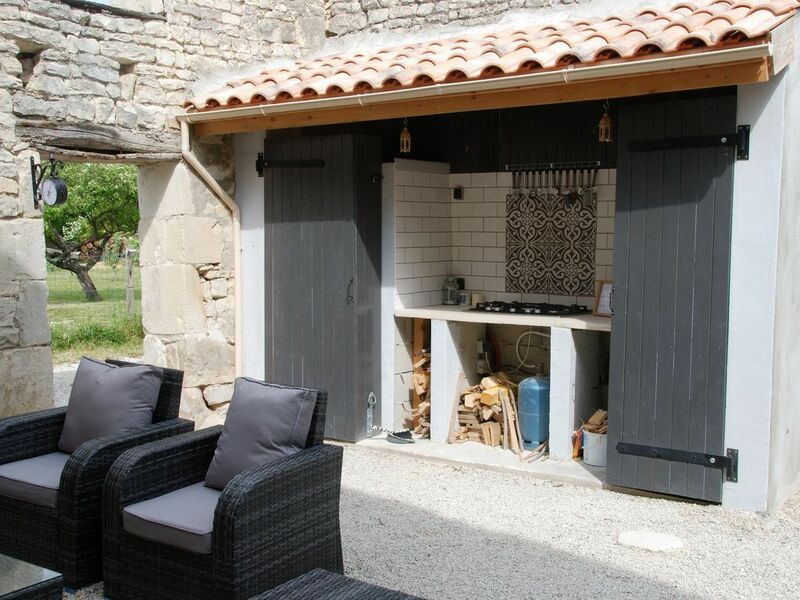 Great as the kitchen may be at Maison du Puits, families will most enjoy the opportunity to cook, eat and relax outdoors thanks to the superb summer kitchen, dining area and outdoor ‘lounge’ in a high-walled courtyard. A clever ‘cupboarded’ galley kitchen opens up to reveal an array of cooking utensils, an oven and a gas hob, then there is a separate food prep area with a kitchen sink and a built in BBQ, plus a wood fired pizza oven and a chiminea. 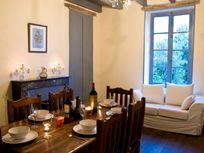 The dining table seats 8, plus high chairs are available, and a lounge area has garden sofas and armchairs for chilling out under the stars. 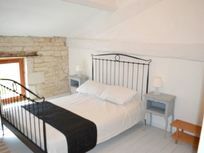 One of the barns off the courtyard has also been kitted out as a teenage den with table football and a pool table. Beyond the courtyard, Maison du Puits is surrounded by an enclosed garden which includes off-street parking, gravel patio areas and a walled, gated swimming pool, which is solar heated and measures 8.1m x 4.5m x 1.2m deep all the way across. 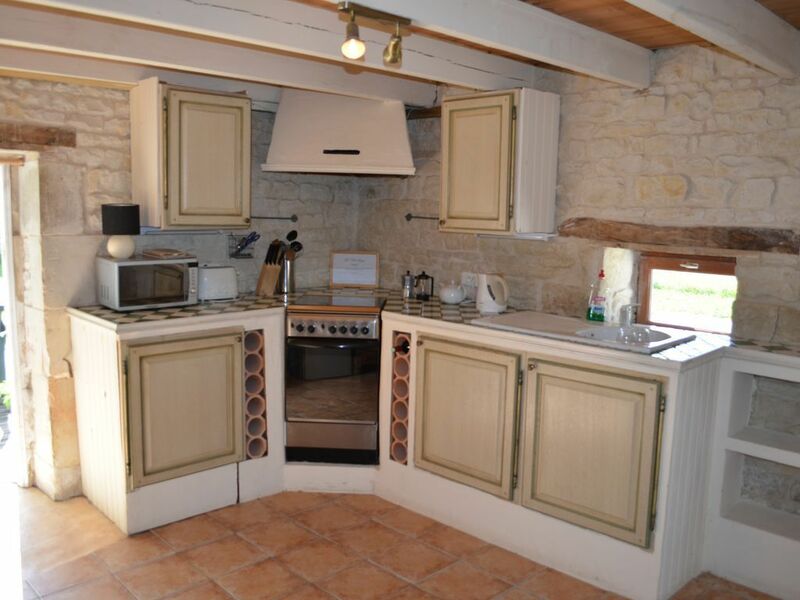 Le Petit Logis (sleeps 2 +baby) was originally the servant’s quarter and ‘bread oven’ for Maison du Puits, tucked away at the rear of the house. Converted into a 1-bedroom cottage, Le Petit Logis is brimming with original charm and character, enhanced by tasteful, ‘shabby chic’ décor’ and cosy home comforts. Perfect for Grandparents or teenagers. In recent years the cottage was extended to incorporate the 13m² lounge, which feels especially light and airy thanks to the high ceiling with two Velux windows, and French doors to the garden and swimming pool. The living room has a TV with English Channels (plus dvd and dvd library) and a corner sofa that easily converts into a large double bed. 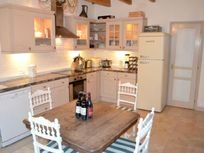 The dining kitchen (16m²) has a rustic farmhouse style, but is well equipped with all mod cons, including a large fridge freezer, gas oven and hob, microwave and slow cooker, plus a washing machine is located in a small outbuilding at the side of the cottage. Le Petit Logis has one cosy and romantic double bedroom on a mezzanine level with an ensuite shower-room and WC. The cottage has its own decked patio with a stone BBQ and access through a walled garden to the 8.1x4.5m pool. Couples staying here also share the fabulous walled courtyard kitchen and outdoor lounge with guests at Maison du Puits, including an outdoor oven, gas hob, food prep area, kitchen sink, built in BBQ and a wood fired pizza oven, plus garden sofas and armchairs, a large dining table and a games barn with table football and a pool table. 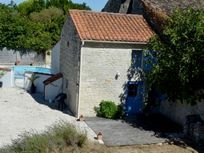 Maison du Puits and Le Petit Logis have a great location for enjoying the highlights of the Charente Maritime’s coast and countryside, 45 minutes inland from La Rochelle on the West Coast of France. The houses are found in the sleepy village of Villeneuve La Comtesse, which is surrounded by fields of sunflowers and has handy local amenities, including the all-important bakery for breakfast pastries and daily baguettes, a minimarket, pharmacy and a children’s playground. 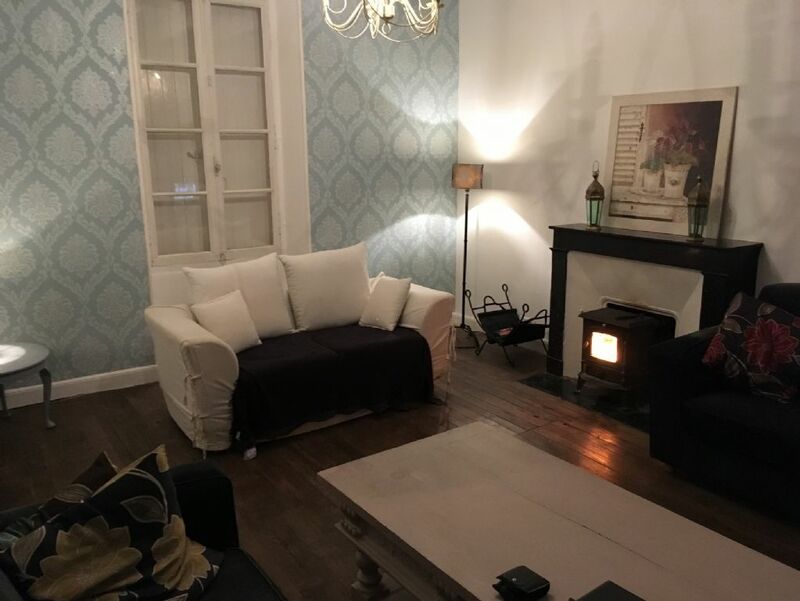 The nearest bar and pizzeria is 20 minutes’ walk or 2 minutes’ drive and there is a wider choice of shops, banks, café bars and restaurants in the market towns of Loulay (5 mins) and Surgeres (10 mins). The lovely old town of Saint Jean d'Angely is only 10 minutes’ drive, with a historic abbey, half-timbered houses and one of the best markets in the region. The town also has a superb aquatics centre with swimming pools, whirlpools, a 54-metre waterslide, sauna, steam rooms and sun terrace, or families can have a picnic by a lake, with a playground, pedalos and mini golf. 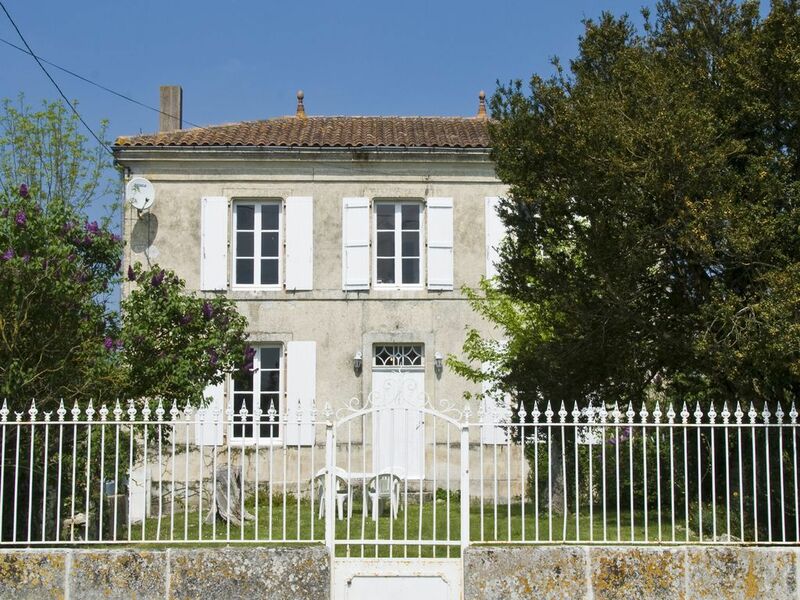 When in France there are always beautiful Chateaux to play knights and princesses in the landscaped grounds and one of the most magnificent is built on an island in the river at Dampierre Sur Boutonne (10 mins). 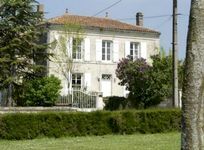 Nearby, little ones might also enjoy meeting the cute and shaggy little donkeys at Poitou Donkey Sanctuary and having a ride on a donkey pulled tractor. Another nice little local attraction is the Port Miniature of Saint-Savinien, where children can sail an amazing fleet of mini boats, steamers and ferries around a lake. Families with a thing for boating will also enjoy exploring the leafy waterways of the Marias Poitivin, (15 minutes), known as ‘Green Venice’ and renowned for its pretty waterside villages, peaceful picnic spots and abundance of wildlife. For animal lovers, Le Palmyre Zoo at Royan (40 mins) is renowned as one of the best in Europe and the underwater equivalent is the Aquarium at La Rochelle which puts budding Octonauts under the waves and up close to an eye popping array of the world’s marine life. 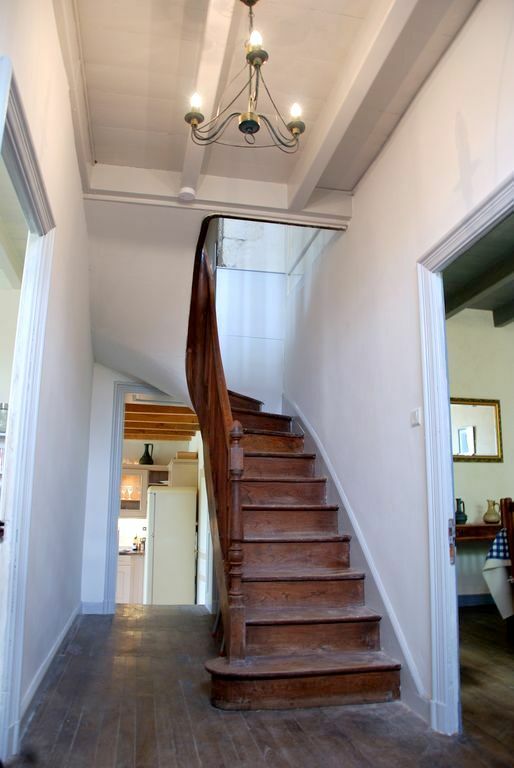 The historic seaport city of La Rochelle as a whole is one of the must visit highlights of the region, from the quayside restaurants around the harbour to the ancient ramparts and buzzing walled town, crammed with pavement cafes and boutique shops. For bucket and spade days by the sea, there is a sandy beach at the seaside resort of Chataillon Plage. From La Rochelle, families can also cross the big suspension bridge to check out the dune backed beaches, criss-crossing cycle tracks and chic harbour towns of the Ile de Re. Nearest medical services: Pharmacy in village, along with adjacent GP. Hi we are Tim and Lucy Cookson from Ilkley, passionate Francofiles and proud parents. 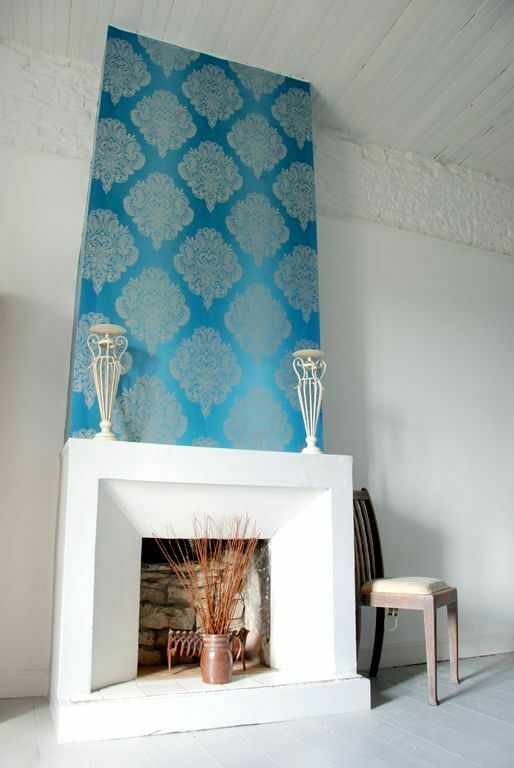 We holiday here twice a year whilst combining our passion for interiors and constantly adding features and extra creature comforts to a house we adore. 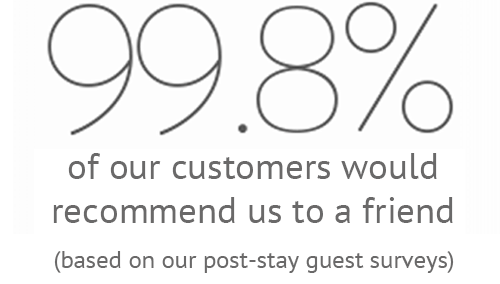 We are always happy to make new friends each year with our guests, even though we are not there, we work very hard to give our guests something that little bit special. We hope to be welcoming you soon. What do they love about it? 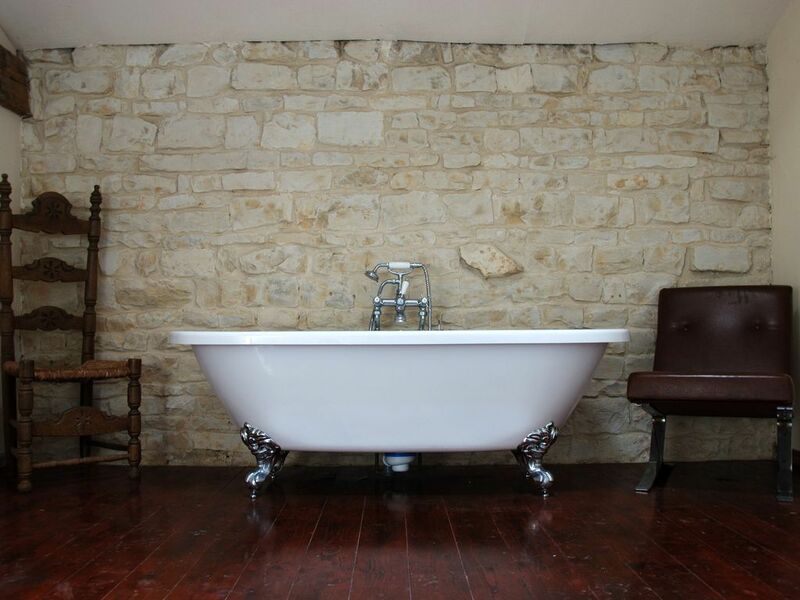 We have always loved period properties ever since our first Victorian house which we bought as soon as we had 3 months wage slips after leaving university! We bought this historic former gentlemans residence in the Autumn of 2003 having scoured the market for a good few months. We wanted a house oozing with character, original features and with a bit splendour if possible!! 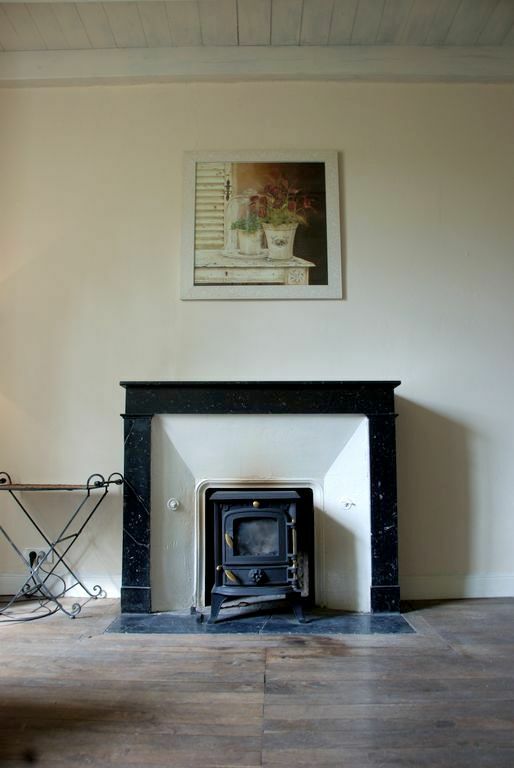 The large windows and the tall ceilings along with the original marble and limestone fireplaces and chestnut floors were all we needed as a starting point really and although no electrics or plumbing were in the main body of the house, we quickly went about our painstaking renovation in the spring of 2004. We extended into the adjoining barn to give us the space we needed and got our way through the brambles and undergrowth and we were receiving guests by the middle of the summer. The following Autumn we made a start on the guest cottage at the back, this tumbling down pile of stones had seen better days and was once upon a time the servants quarters and bread oven to the main house. The roof had collapsed but we loved the cuteness of it with its limestone facade and Mary Poppins low down upstairs bedroom window. We thought with this being tucked round the back and really secluded it would make a perfect romantic couples retreat and so set about unleashing its character with a healthy nod to Provence in its styling. Some 11 years later we added a modern light bright extension with patio doors into the swimming pool. 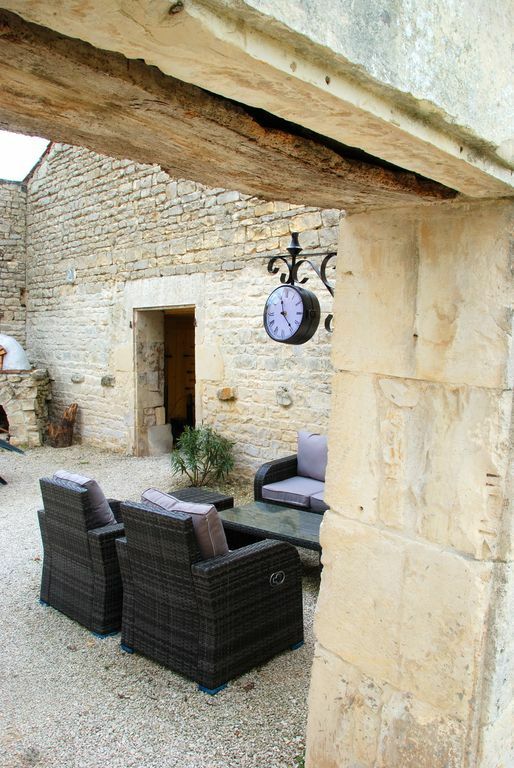 Recently we created a wonderful alfresco kitchen, dining and lounge area in the old courtyard with a teenagers nook in the old barn which houses a pool table, perfect for families sharing all together. 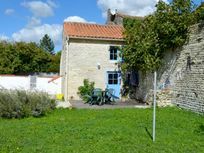 The main family with the children in the big house, the teenagers or the grandparents in the little house away from the noise of the kids, with the courtyard bang splat in the middle, a perfect meeting place for the important things in life, eating, drinking and being merry. 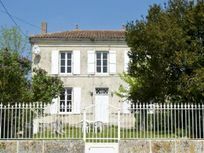 We love the village location with all its amenities and the fact you are central to everywhere like La Rochelle, Cognac. Saintes, the Marais Poitevin with great toll road and tgv links, this is our springboard into Europe. What do the kids love about it? Kids with love the toys in the large dining room. A large old original cupboard opens up to reveal their toys games books and dvds and they have their own little sofa to be able to watch their own tv linked to a dvd. They will feel safe and secure tucked up their beds with bed guards, stair gates etc. Waking up refreshed to play in the swimming pool with its inflatable toys or riding about on the trikes. A decent park is only a 2 minute stroll away, ideal if they want to run around with other children. The wood fired pizza oven will be exciting for the little ones too, being able to build their own pizzas and watch the flames cook them in minutes. Sleeps 10 + infants in 2 x double bedrooms and 1 x quad room with a double bed and a double sofa bed. Seperate Let Petit Logis with double bedroom. La Rochelle is just an hour away. St Malo is just over 4hrs drive away. 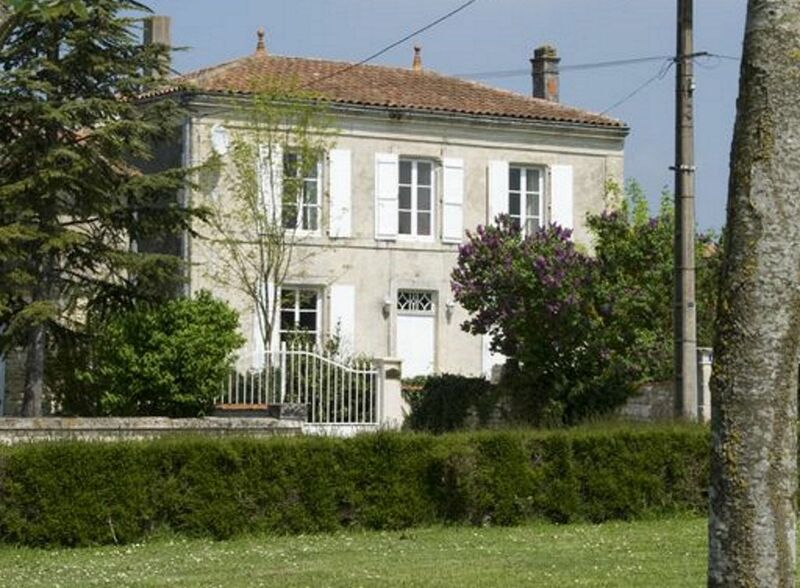 Mini market and boulangerie all between 3 and 7 mins walk, nearest bar /restaurant 3 min drive or 25 min walk. 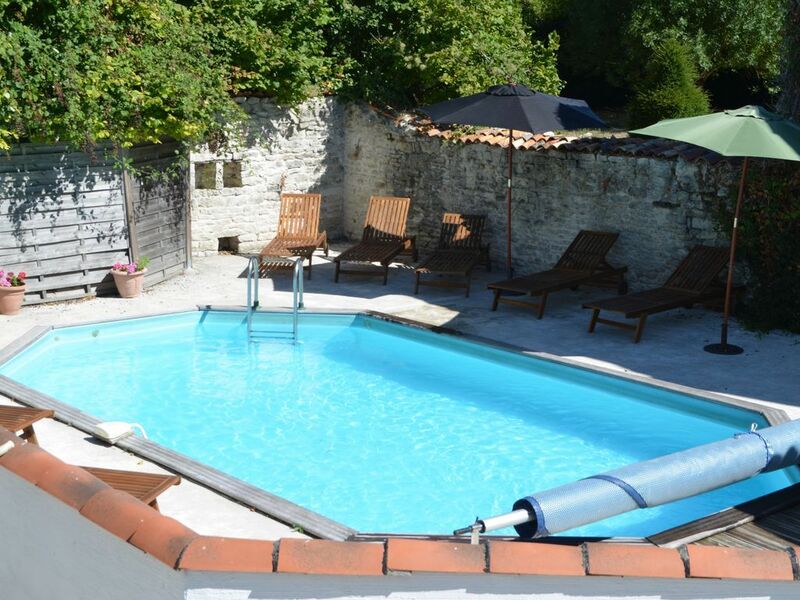 Solar heated pool 8.1 m by 4.6 m 1.2 m deep all the way, safety child gate and pool alarm in walled garden. 2 x cots (travel), 2 x high chairs, bed guards, matress and pillow protectors on all beds, stairgates, plastic crockery and sippy cups, steriliser, blender, toilet seat reducers in all bathrooms plus step up stools, baby bath, kitchen cupboards and drawers have baby proof catches. 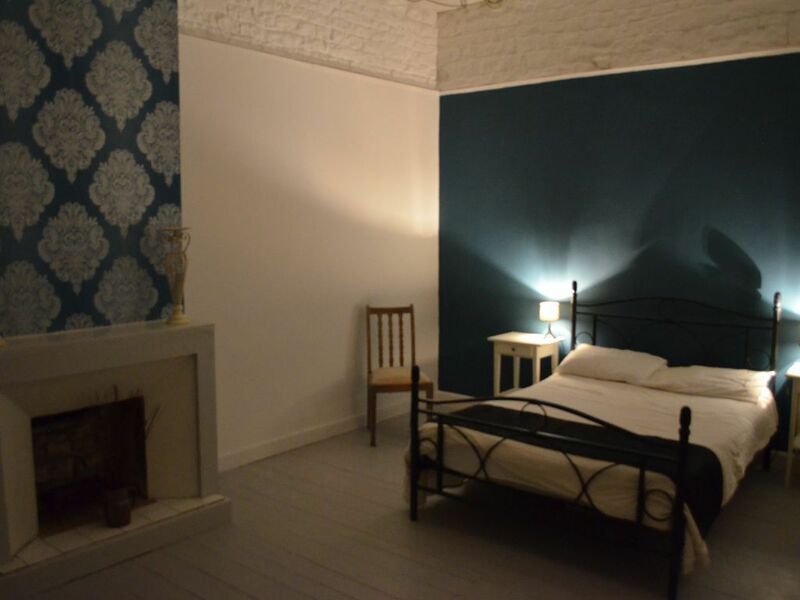 Dolls house, art easel, rocking horse, bundles of toys from 1 month right up to 8 years old, kids books, kids tv and DVD set up in play room with sofa. Pre arrival shopping can be arranged. Buckets and spades for the beach, various toys and trikes. Gardens all totally enclosed front back and side with iron entry gates and walls right round the perimeter. 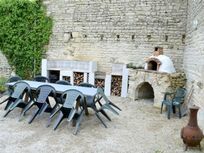 There are 3 BBQs available and outside dining area. 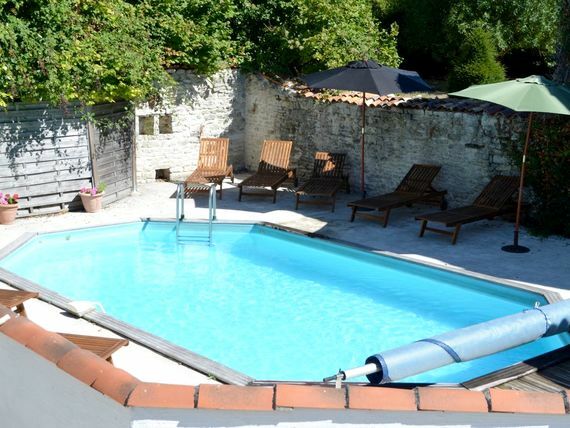 30 mins drive away in Niort. Tennis courts can be found in the nearby village. Up to 2 cots and highchairs are available. Fireplace in two lounge rooms and log burner in kitchen.